Edward Fisher, Robin Youngs, Musheer Hussain, Jonathan Fishman,	The Journal of Laryngology & Otology, Volume 130 Issue 6, p 511. N Stobbs, A Lillis, N Kumar,	The Journal of Laryngology & Otology, Volume 130 Issue 6, pp 512-515. M J Rouhani,	The Journal of Laryngology & Otology, Volume 130 Issue 6, pp 516-520. 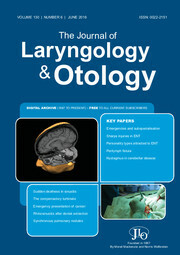 S H Hung, H C Lin, L T Kao, C S Wu, S D Chung,	The Journal of Laryngology & Otology, Volume 130 Issue 6, pp 521-525. J A Meldrum, P R Prinsley,	The Journal of Laryngology & Otology, Volume 130 Issue 6, pp 526-531. R L Heywood, S N Ifeacho, A A Narula,	The Journal of Laryngology & Otology, Volume 130 Issue 6, pp 532-535. Y Ogawa, K Otsuka, A Hagiwara, T Inagaki, S Shimizu, N Nagai, U Konomi, S Itani, T Kondo, M Suzuki,	The Journal of Laryngology & Otology, Volume 130 Issue 6, pp 536-540. Has the use of the linear incision reduced skin complications in bone-anchored hearing aid implantation? R Roplekar, A Lim, S S M Hussain,	The Journal of Laryngology & Otology, Volume 130 Issue 6, pp 541-544. A K Mishra, V R Sinha, A Nilakantan, D K Singh,	The Journal of Laryngology & Otology, Volume 130 Issue 6, pp 545-553. Does septoplasty change the dimensions of compensatory hypertrophy of the middle turbinate? D Demir, K Asil, M Güven, Ü Erkorkmaz,	The Journal of Laryngology & Otology, Volume 130 Issue 6, pp 554-559. C G Leonard, C Masih, S McDonald, G Taylor, N Maiden, P J Leyden,	The Journal of Laryngology & Otology, Volume 130 Issue 6, pp 560-564. K-P Chang, C-C Lee, Y-C Su, M-L Han, T-H Kung, H-J Chang,	The Journal of Laryngology & Otology, Volume 130 Issue 6, pp 565-570. M Bannister, V Vallamkondu, K W Ah-See,	The Journal of Laryngology & Otology, Volume 130 Issue 6, pp 571-574. I Zammit-Maempel, R Kurien, V Paleri,	The Journal of Laryngology & Otology, Volume 130 Issue 6, pp 575-580. A Vijendren, J Sanchez, M Yung,	The Journal of Laryngology & Otology, Volume 130 Issue 6, pp 581-586. A Vijendren, M Yung, J Sanchez, U Shiralkar, L Weigel,	The Journal of Laryngology & Otology, Volume 130 Issue 6, pp 587-595. M Roos, I Butler,	The Journal of Laryngology & Otology, Volume 130 Issue 6, pp 596-599. N Jufas, N Patel,	The Journal of Laryngology & Otology, Volume 130 Issue 6, p 604.